Undocumented Californians have a high uninsured rate. The uninsurance rate for undocumented California adults is high for several reasons. Undocumented California adults are excluded from full Medi-Cal benefits under federal policy. However, using state funds, California has extended eligibility for full Medi-Cal benefits to all Californians with Deferred Action for Childhood Arrivals (DACA) status. Under federal policy, undocumented Californians are not eligible to purchase insurance through Covered California, with or without subsidies. All Californians can purchase insurance directly from insurers, though most undocumented adults likely have difficulty affording insurance without subsidies due to the high cost of premiums relative to their income. County programs improve access to care for undocumented immigrants in some counties but significant gaps remain. Some California counties provide access to some non-emergency care to uninsured low-income individuals, regardless of immigration status. However, programs vary significantly in terms of services covered and income eligibility standards, and some programs cap enrollment.11 This variation, in part, reflects both variation in available funding and differences in how counties prioritize resources. These county programs are valuable for those who are eligible. Research has shown that one of the most comprehensive county programs, Healthy San Francisco, has improved access to care, resulted in greater primary care service use, and reduced emergency department visits and potentially avoidable hospitalizations.12 However, programs that cover a relatively comprehensive set of services are not available to many uninsured undocumented residents in the state. Many undocumented adults are enrolled in restricted-scope Medi-Cal, but the benefits are limited. As of June 2018, a total of 955,000 undocumented California adults were enrolled in restricted-scope Medi-Cal,15 or approximately 80 percent of those eligible.16 State enrollment data from 2013 indicates that undocumented individuals enrolled in restricted-scope Medi-Cal were enrolled for an average of 41 continuous months.17 Some adults enroll in restricted-scope Medi-Cal when they seek care at a hospital or clinic. Others may enroll themselves when they are enrolling eligible family members (such as citizen children) in full-scope coverage, even when they have no need for emergency or pregnancy-related services at the time. Like full-scope enrollees, restricted-scope enrollees must renew their coverage annually. The take-up rate for restricted-scope Medi-Cal is approaching California’s overall projected Medi-Cal enrollment rate of close to 90 percent in 2020 and beyond.18 This finding may appear to run counter to national research that has suggested that undocumented immigrants and their family members are less likely to enroll in public programs due to fear of negative immigration enforcement action for themselves or their families, concern about ability to adjust immigration status in the future, and a general fear and mistrust of public programs.19 Furthermore, in the last couple of years, fear among immigrant families has increased in response to increased anti-immigrant policies and practices at the federal level. During this time period, California health care providers have reported that they have increasingly observed immigrant families being more likely to skip scheduled health care appointments or avoid seeking care and showing more concern about enrolling in public programs.20 Enrollment in restricted-scope Medi-Cal fell by 3.6 percent between November 2016 and June 2018, compared to a 2.5 percent decline in enrollment among all other enrollees.21 It is unclear how much of the decline in enrollment among both groups was due to economic and demographic factors, such as the increase in the minimum wage and the overall decline in the undocumented population size, and how much is due to immigrants’ fear of enrolling in public programs. Safety net providers are an important source of care for undocumented Californians. Undocumented Californians generally have worse access to care. The same study found that among California Latinos who needed help for an emotional or mental issue or needed an alcohol or drug program in the last year, undocumented Latinos were the most likely to not get help due to concern about the cost of treatment. Undocumented Californians’ greater likelihood of lacking insurance contributes to these access-to- care trends, though it is not the only driver. California could extend a similar policy to low-income undocumented adults and utilize a similar automatic transition process. Enacting such a policy would not require any federal approval. High rates of uninsurance in a community can even affect those with insurance. A 2009 study by the Institute of Medicine concluded that when communities have high rates of uninsurance, “insured adults in those communities are more likely to have difficulties obtaining needed health care and to be less satisfied with the care they receive.”48 The mechanisms by which high uninsurance rates in a particular community affect those who are insured are not well-established, but the Institute of Medicine study suggested that financial pressures on health care delivery systems in such communities could lead to lower investment in local health care systems as well as lower concentrations of providers, both of which could have spillover effects on insured residents. An estimated 1.15 million California low-income undocumented adults would be eligible if full-scope Medi-Cal were expanded in 2020. Today, parents and childless adults who are citizens or lawful permanent residents are eligible for Medi-Cal if they are in households with income at or below 138 percent of the Federal Poverty Level (FPL), approximately $16,750 for a single person or $34,640 for a family of four. Income eligibility standards for seniors and disabled individuals vary depending on their individual circumstances. Estimates of the size of the overall California undocumented population vary substantially at any point in time and are subject to significant uncertainty because surveys generally do not ask respondents directly whether they are undocumented.55 For the same reason, income and age distribution estimates for undocumented Californians are also subject to uncertainty. Additionally, the number of undocumented California adults could change over time due to other factors not modeled in this analysis. For example, this eligibility estimate assumes no change in the overall size of the undocumented population between 2016 and 2020 because projections are not available. However, the Pew Research Center estimates that the undocumented population in California has declined over time, from 2.8 million in 2007 to 2.2 million in 2016.56 The Pew Research Center primarily attributes the net decline in the number of undocumented immigrants nationally to a significant decline in the number of new undocumented immigrants, particularly among Mexican immigrants.57 If the decline in the number of undocumented immigrants continues, the number eligible for Medi-Cal could also decline. Additionally, the number of low-income undocumented adults could change as a result of broader economic trends, such as a recession. Between 680,000 and 1.05 million undocumented adults could enroll, depending on the extent to which federal immigration policy dampens enrollment. Scenario 1 assumes that total enrollment in Medi-Cal among undocumented adults increases beyond current levels. 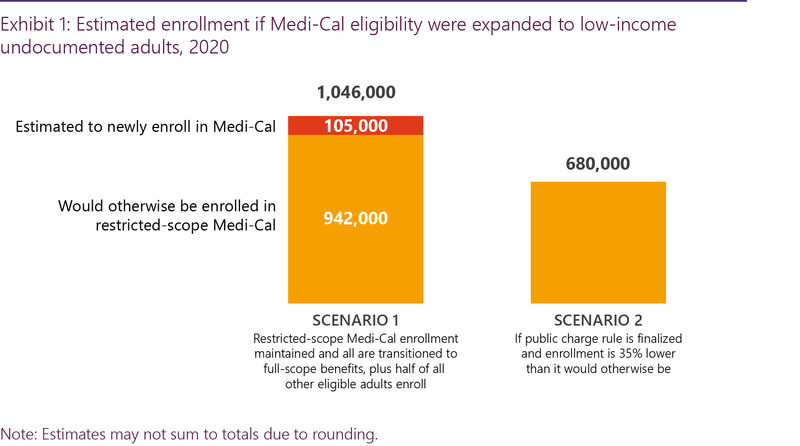 Specifically, this scenario assumes that enrollment in restricted-scope Medi-Cal continues at similar levels, falling only slightly by 2020 due to reduced eligibility associated with increases in the minimum wage, and that all enrolled adults are automatically transitioned to full-scope Medi-Cal under an expansion. Under Scenario 1, half of those who would be eligible for Medi-Cal under an expansion but not already enrolled in restricted-scope Medi-Cal are assumed to newly enroll. Scenario 2 assumes that the U.S. Department of Homeland Security finalizes its recent proposal that would expand and toughen the “public charge” test applied when people apply for a green card or to enter the county. Even though the proposed rule would not directly apply to Medi-Cal-covered emergency services or state-funded benefits, the rule is complex and, if finalized, is anticipated to cause fear and confusion that will ultimately have a “chilling effect” on enrollment in Medi-Cal, decreasing enrollment by as much as 35 percent, including by many who are not legally subject to the rule. Scenario 2 reflects estimated enrollment if this proposed rule is finalized and if 35 percent fewer individuals enroll than under Scenario 1. These are two of many possible scenarios for enrollment. Take-up rates are subject to significant uncertainty and will depend on factors such as trends in immigration policy and enforcement and the extent to which an expansion in eligibility is coupled with culturally and linguistically appropriate outreach and enrollment assistance, as well as larger economic and demographic trends that affect the number of eligible undocumented immigrants, including minimum wage increases and employment trends. In total, an estimated 1.05 million undocumented adults would enroll in full-scope Medi-Cal coverage in 2020 under Scenario 1, or 91 percent of those eligible (see Exhibit 1). The vast majority of eligible adults are projected to be enrolled in restricted-scope Medi-Cal coverage in 2020: 942,000 or 82 percent, which is slightly lower than the number enrolled as of 2018 due to a reduction in eligibility as wages increase. If the state expanded full-scope Medi-Cal to all low-income residents, regardless of immigration status, these 942,000 adults could be automatically transitioned to full-scope coverage, as was done under the eligibility expansion for undocumented children. Of the remaining 210,000 adults estimated to be eligible, it is assumed in this scenario that 50 percent, or 105,000, would enroll in Medi-Cal.This take-up rate, which was also assumed in an analysis by the California Legislative Analyst’s Office,58 is conservative because this group of eligible adults includes some low-income adults who have employer-sponsored insurance and would not switch to Medi-Cal coverage. In this analysis, it is assumed that all new enrollees are non-disabled individuals under age 65 because individuals with disabilities or seniors are more likely to have already enrolled in restricted-scope Medi-Cal. Approximately 104,000 enrollees, or 10 percent, of the 1.05 million enrollees would be young adults age 19-25. Potential changes in immigration policy, such as the proposed “public charge” rule currently being considered by the U.S. Department of Homeland Security, could hamper enrollment.63 If finalized as drafted, the proposed rule would allow the government to consider enrollment in full-scope Medicaid benefits, among other public programs, as a negative factor that counts against individuals in their application for lawful permanent residence. A similar test would be applied to those seeking to extend or change their non-immigrant status. Participation in certain public programs is one of a number of circumstances considered in the proposed “public charge” test. The government would weigh public program participation and other negative factors, such as limited English proficiency, certain health conditions, or poor credit scores, against positive factors, such as education, skills, job prospects, or family members who can provide support. The proposed rule would not consider Medicaid coverage for emergency services or state and local programs (other than cash assistance programs or government-funded long-term care) in a public charge determination. Although many immigrants are exempt from the public charge test or do not currently have a pathway to lawful permanent residence, the proposed rule is likely to deter many immigrants and their U.S. citizen family members from enrolling in public programs, including restricted-scope Medi-Cal, due to fear of or confusion about the consequences that enrolling could have for themselves or family members in the future. Research on the effects of welfare reform in 1996 found that after legal immigrants’ access to public benefits was restricted under the Personal Responsibility and Work Opportunity Reconciliation Act of 1996 (PRWORA), many immigrant families disenrolled from public programs, even when they continued to be eligible.64 This chilling effect on enrollment was in part due to fear and confusion about the consequences that enrolling would have for their own immigration status or that of a family member. Scenario 2 focuses on the 35-percent disenrollment scenario as an outer bound. An estimated 680,000 undocumented adults would enroll in Medi-Cal in 2020 if enrollment were 35 percent lower than estimated in Scenario 1 (see Exhibit 1). The extent to which enrollment would be affected by a final public charge rule and the time period over which that change would occur is subject to significant uncertainty. This estimate assumes that the chilling effect on enrollment would occur by 2020, but the chilling effect could occur more slowly depending on a number of factors, such as the implementation date of a final rule and how long it takes for individuals’ Medi-Cal enrollment and renewal decisions to change in response to the perceived risks. Expanding Medi-Cal to all adults would reduce the number of uninsured in the state by up to one-quarter, potentially newly insuring more than one million Californians. This expansion could improve access to preventive and routine care and improve financial security for those who enroll, in addition to potentially improving worker productivity for those who become newly insured. California has been a leader in recent years in adopting policies that recognize the important contributions that undocumented immigrants make to the state and its economy. For example, California has passed laws that provide access to driver’s licenses, protect from deportation, and help to ensure rights for undocumented workers. California has also been a leader among states in getting closer to universal health coverage by adopting the optional Medicaid expansion under the ACA, creating a state-based health insurance exchange, making strong investments in outreach and enrollment efforts, and adopting more inclusive Medi-Cal eligibility policies than required under federal law. Expanding Medi-Cal to all low-income residents, regardless of immigration status, would further enhance the state’s model role in establishing policies that are inclusive of immigrants and value universal health coverage. 1. Pew Research Center, “Unauthorized Immigrant Population Trends for States, Birth Countries and Regions,” November 27, 2018, http://www.pewhispanic.org/interactives/unauthorized-trends/. 2. Nadereh Pourat, “Six Facts About Undocumented Californians” (California Health Care Foundation, June 6, 2018), https://www.chcf.org/publication/six-facts-about-undocumented-californians/. 3. Jeffrey S Passel and D’Vera Cohn, “Size of U.S. Unauthorized Immigrant Workforce Stable After the Great Recession,” November 3, 2016, http://www.pewhispanic.org/2016/11/03/size-of-u-s-unauthorized-immigrant-workforce-stable-after-the-great-recession/. 4. Meg Wiehe and Misha Hill, “State and Local Tax Contributions of Undocumented Californians: County-by- County Data” (Institute on Taxation and Economic Policy, April 2017), https://itep.org/state-and-local-tax-contributions-of-undocumented-californians-county-by-county-data/. 5. “Undocumented Immigrants in California,” Public Policy Institute of California (blog), accessed December 3, 2018, https://www.ppic.org/publication/undocumented-immigrants-in-california/. 6. Migration Policy Institute, “Profile of the Unauthorized Population – CA | Migrationpolicy.Org,” accessed November 30, 2018, https://www.migrationpolicy.org/data/unauthorized-immigrant-population/state/CA. 7. Manuel Pastor et al., “What’s at Stake for the State?” (Center for the Study of Immigrant Integration at University of Southern California, May 2013), http://dornsife.usc.edu/csii/undocumentedca/. 8. Miranda Dietz et al., “California’s Health Coverage Gains to Erode Without Further State Action” (UC Berkeley Center for Labor Research and Education and UCLA Center for Health Policy Research, November 27, 2018), http://laborcenter.berkeley.edu/ca-coverage-gains-to-erode-without-further-state-action/. 10. This estimate likely understates the disparity in employer-sponsored insurance rates for undocumented immigrants because the group “non-citizens without a green card” includes both undocumented immigrants and immigrants with work authorization. Shana Alex Charles et al., “The State of Health Insurance in California: Findings from the 2014 California Health Interview Survey” (UCLA Center for Health Policy Research, January 31, 2017), http://healthpolicy.ucla.edu/publications/search/pages/detail.aspx?PubID=1603. 11. Ken Jacobs and Laurel Lucia, “Universal Health Care: Lessons From San Francisco,” Health Affairs 37, no. 9 (September 1, 2018): 1375–82, https://doi.org/10.1377/hlthaff.2018.0432. 12. Catherine McLaughlin et al., “Evaluation of Healthy San Francisco” (Mathematica Policy Research, 2011), https://www.mathematica-mpr.com/our-publications-and-findings/publications/evaluation-of-healthy-san-francisco. 13. California Department of Health Care Services, “Medi-Cal FAQs 2014,” accessed December 21, 2018, https://www.dhcs.ca.gov/services/medi-cal/eligibility/Pages/Medi-CalFAQs2014b.aspx. California Department of Health Care Services, “All County Welfare Directors Letter 17-03,” January 25, 2017, https://www.dhcs.ca.gov/services/medi-cal/eligibility/Documents/ACWDL/2017/17-03.pdf. 14. There are some programs that provide kidney dialysis and breast or cervical cancer treatment for eligible adults regardless of immigration status, but do not provide means of accessing coverage for other chronic conditions. 15. California Department of Health Care Services, Research and Analytic Studies Division, “Medi-Cal Monthly Enrollment Fast Facts June 2018,” https://www.dhcs.ca.gov/dataandstats/statistics/Documents/Fast_Facts_June2018_ADA.pdf. 16. See discussion later in this report about the estimated number of eligible individuals. 17. California Department of Health Care Services, “Population: Length of Continuous Enrollment, as of January 2013,” accessed December 21, 2018, https://www.dhcs.ca.gov/dataandstats/statistics/Documents/3_27_Population_Distribution_Length_of_Continuous.pdf. 19. K.M. Pereira, R. Crosnoe, K Fortuny, J.M. Pedroza, K. Ulvestad, C. Weiland, H. Yoshikawa, and A. Chaudry (Urban Institute), Barriers to Immigrants’ Access to Health and Human Services Programs. Prepared under contract with the U.S. Department of Health and Human Services, Office of the Assistant Secretary for Planning and Evaluation, May 2012. 20. The Children’s Partnership and California Immigrant Policy Center, “Healthy Mind, Healthy Future: Promoting the Mental Health and Wellbeing of Children in Immigrant Families,” August 2018, https://www.childrenspartnership.org/research-list/healthy-mind-healthy-future-promoting-the-mental-health-and-wellbeing-of-children-in-immigrant-families/. 21. California Department of Health Care Services, Research and Analytic Studies Division, “Medi-Cal Monthly Enrollment Fast Facts November 2016,” November 2016), https://www.dhcs.ca.gov/dataandstats/statistics/documents/fast_facts_nov_2016.pdf. California Department of Health Care Services, Research and Analytic Studies Division, “Medi-Cal Monthly Enrollment Fast Facts June 2018,” https://www.dhcs.ca.gov/dataandstats/statistics/Documents/Fast_Facts_June2018_ADA.pdf. 22. California Health and Human Services Agency, “MC 219 Form – Important Information for Persons Requesting Medi-Cal,” November 2015, https://www.dhcs.ca.gov/formsandpubs/forms/Forms/MCED/MC_Forms/MC219_ENG_1115.pdf. 23. Tricia Brooks et al., “Medicaid and CHIP Eligibility, Enrollment, Renewal, and Cost Sharing Policies as of January 2017: Findings from a 50-State Survey – Medicaid and CHIP Enrollment and Renewal Processes,” The Henry J. Kaiser Family Foundation (blog), January 12, 2017, https://www.kff.org/report-section/medicaid-and-chip-eligibility-enrollment-renewal-and-cost-sharing-policies-as-of-january-2017-medicaid-and-chip-enrollment-and-renewal-processes/. 24. Emily Zentner, “More than a Million Undocumented Immigrants Have Received California Driver’s Licenses,” Sacramento Bee, April 4, 2018, https://www.sacbee.com/news/politics-government/capitol-alert/article207939584.html. 25. “California Assembly Bill 60,” Pub. L. No. 60 (2013), http://www.leginfo.ca.gov/pub/13-14/bill/asm/ab_0051-0100/ab_60_bill_20131003_chaptered.html. 26. “Access to the Health Care Safety Net in California,” Public Policy Institute of California (blog), accessed January 27, 2019, https://www.ppic.org/publication/access-to-the-health-care-safety-net-in-california/. 28. Alexander N. Ortega et al., “Health Care Access and Physical and Behavioral Health Among Undocumented Latinos in California,” Medical Care 56, no. 11 (November 1, 2018): 919–26, https://doi.org/10.1097/MLR.0000000000000985. 29. Nadereh Pourat et al., “Assessing Health Care Services Used By California’s Undocumented Immigrant Population In 2010,” Health Affairs 33, no. 5 (May 2014): 840–47, https://doi.org/10.1377/hlthaff.2013.0615. 30. Claire D. Brindis et al., “Realizing the Dream for Californians Eligible for Deferred Action for Childhood Arrivals (DACA): Health Needs and Access to Health Care,” March 2014, http://laborcenter.berkeley.edu/realizing-the-dream-for-californians-eligible-for-deferred-action-for-childhood-arrivals-daca-health-needs-and-access-to-health-care/. 31. Marissa Raymond-Flesch et al., “‘There Is No Help Out There and If There Is, It’s Really Hard to Find’: A Qualitative Study of the Health Concerns and Health Care Access of Latino ‘DREAMers,’” Journal of Adolescent Health 55, no. 3 (September 1, 2014): 323–28, https://doi.org/10.1016/j.jadohealth.2014.05.012. 32. “California Senate Bill 75,” Pub. L. No. 75 (2015), https://leginfo.legislature.ca.gov/faces/billNavClient.xhtml?bill_id=201520160SB75. 33. California Department of Health Care Services, “SB 75 Transitions and New Enrollees by County,” September 10, 2018, https://www.dhcs.ca.gov/services/medi-cal/eligibility/Documents/SB75/SB75_Enrollees_County_091018.pdf. 34. Benjamin D. Sommers, Atul A. Gawande, and Katherine Baicker, “Health Insurance Coverage and Health—What the Recent Evidence Tells Us,” New England Journal of Medicine 377 (August 10, 2917): 586–93. 35. Benjamin D. Sommers, Katherine Baicker, and Arnold M. Epstein, “Mortality and Access to Care among Adults after State Medicaid Expansions,” New England Journal of Medicine 367, no. 11 (September 13, 2012): 1025–34, https://doi.org/10.1056/NEJMsa1202099. Katherine Baicker and Amy Finkelstein, “The Effects of Medicaid Coverage — Learning from the Oregon Experiment,” New England Journal of Medicine 365, no. 8 (2011): 683–85. 36. Jonathan T. Kolstad and Amanda E Kowalski, “The Impact of Health Care Reform On Hospital and Preventive Care: Evidence from Massachusetts,” Working Paper (National Bureau of Economic Research, May 2010), https://doi.org/10.3386/w16012. 37. Benjamin D. Sommers, Sharon K. Long, and Katherine Baicker, “Changes in Mortality After Massachusetts Health Care Reform: A Quasi-Experimental Study,” Annals of Internal Medicine 160, no. 9 (May 6, 2014): 585, https://doi.org/10.7326/M13-2275. 38. Adele Shartzer, Sharon K. Long, and Nathaniel Anderson, “Access To Care And Affordability Have Improved Following Affordable Care Act Implementation; Problems Remain,” Health Affairs 35, no. 1 (January 1, 2016): 161–68, https://doi.org/10.1377/hlthaff.2015.0755. 39. Benjamin D. Sommers et al., “Changes in Utilization and Health Among Low-Income Adults After Medicaid Expansion or Expanded Private Insurance,” JAMA Internal Medicine 176, no. 10 (October 1, 2016): 1501–9, https://doi.org/10.1001/jamainternmed.2016.4419. 40. Ausmita Ghosh, Kosali Simon, and Benjamin D Sommers, “The Effect of State Medicaid Expansions on Prescription Drug Use: Evidence from the Affordable Care Act,” Working Paper (National Bureau of Economic Research, January 2017), https://doi.org/10.3386/w23044. 41. Hefei Wen, Benjamin G. Druss, and Janet R. Cummings, “Effect of Medicaid Expansions on Health Insurance Coverage and Access to Care among Low-Income Adults with Behavioral Health Conditions,” Health Services Research 50, no. 6 (December 2015): 1787–1809, https://doi.org/10.1111/1475-6773.12411. 43. Bhashkar Mazumder and Sarah Miller, “The Effects of the Massachusetts Health Reform on Household Financial Distress,” American Economic Journal: Economic Policy 8, no. 3 (August 2016): 284–313, https://doi.org/10.1257/pol.20150045. 44. Luojia Hu et al., “The Effect of the Patient Protection and Affordable Care Act Medicaid Expansions on Financial Wellbeing,” Working Paper (National Bureau of Economic Research, April 2016), https://doi.org/10.3386/w22170. 46. Allan Dizioli and Roberto Pinheiro, “Health Insurance as a Productive Factor,” Labour Economics 40 (June 1, 2016): 1–24, https://doi.org/10.1016/j.labeco.2016.03.002. 47. Sang Nguyen and Alice Zawacki, “Health Insurance and Productivity: Evidence from the Manufacturing Sector,” Working Papers (Center for Economic Studies, U.S. Census Bureau, September 2009), https://ideas.repec.org/p/cen/wpaper/09-27.html. 48. “America’s Uninsured Crisis: Consequences for Health and Health Care,” Institute of Medicine, accessed January 27, 2019, http://www.nationalacademies.org/hmd/Reports/2009/Americas-Uninsured-Crisis-Consequences-for-Health-and-Health-Care.aspx. 49. The estimate excludes a small number of individuals who already have full-scope Medi-Cal coverage, such as those granted Deferred Action for Childhood Arrivals (DACA) status. 52. This is a rough estimate of the change in eligibility over time using preliminary analysis from the UCLA-UC Berkeley California Simulation of Insurance Markets (CalSIM) model version 2.2, which models changes in the statewide and local minimum wages. The CalSIM model proportionally increases the wages of California workers with income below the minimum wage. In addition, the analysis assumes a “ripple effect” for workers whose wages are within 123 percent of the minimum wage, based on previous research. These workers are expected to also receive a partial wage increase as an indirect effect of the law, though it is not required under the law. CalSIM 2.2 assumes that the change in Medi-Cal eligibility occurs immediately after each wage increase is implemented, but for the purposes of this analysis, we assume a one-year lag between when the wage increase occurs and when eligibility changes due to income because, in practice, many enrollees will be discontinued from Medi-Cal when they are found to be ineligible upon their annual redetermination. 53. California Department of Industrial Relations, “Minimum Wage,” accessed December 21, 2018, https://www.dir.ca.gov/dlse/faq_minimumwage.htm. 54. UC Berkeley Labor Center, “Inventory of US City and County Minimum Wage Ordinances,” Center for Labor Research and Education, June 20, 2018, http://laborcenter.berkeley.edu/minimum-wage-living-wage-resources/inventory-of-us-city-and-county-minimum-wage-ordinances/. 55. Estimates of the undocumented population in California range substantially from 2.2 million in 2016, according to the Pew Research Center, to 3.1 million, according to Migration Policy Institute using 2012-2016 data, with estimates from the Center for Migration Studies and Department of Homeland Security falling in between these estimates. Pew Research Center, “Unauthorized Immigrant Population Trends for States, Birth Countries and Regions.” Migration Policy Institute, “Profile of the Unauthorized Population – CA | Migrationpolicy.Org.” Center for Migration Studies, “State-Level Unauthorized Population and Eligible-to-Naturalize Estimates,” 2014, http://data.cmsny.org/. U.S. Department of Homeland Security, “Estimates of the Unauthorized Immigrant Population Residing in the United States” (U.S. Department of Homeland Security, December 2018), https://www.dhs.gov/immigration-statistics/population-estimates/unauthorized-resident. 57. Jeffrey S. Passel and D’Vera Cohn, “U.S. Unauthorized Immigration Total Lowest in a Decade” (Pew Research Center, November 27, 2018), http://www.pewhispanic.org/2018/11/27/u-s-unauthorized-immigrant-total-dips-to-lowest-level-in-a-decade/. 58. California Legislative Analyst’s Office, “Estimating the Cost of Expanding Full-Scope Medi-Cal Coverage to Undocumented Adults,” May 10, 2018, https://lao.ca.gov/Publications/Report/3827. 61. This analysis assumes a lower proportion of undocumented Medi-Cal enrollees would be in disabled aid codes than current enrollees based on their lower rate of not working due to disability. This estimate also takes into account that some disabled undocumented adults already have insurance coverage. 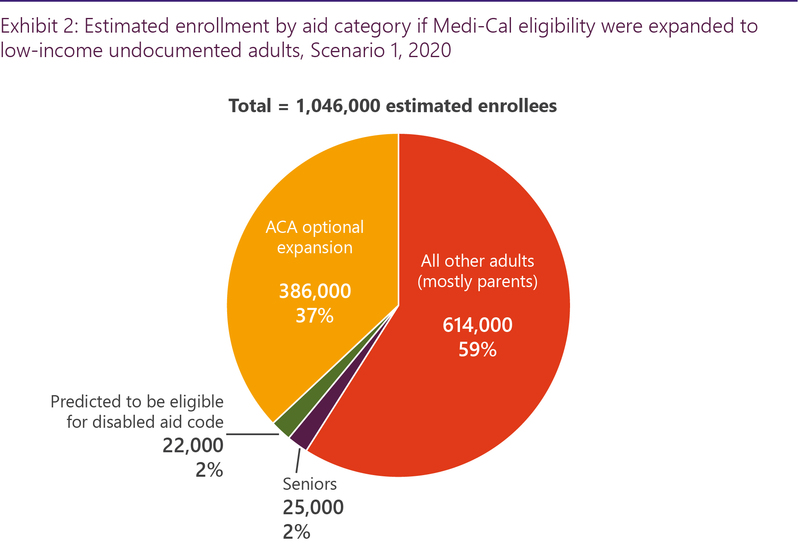 Additionally, some individuals with disabilities are enrolled in the ACA expansion aid group, and similar enrollment trends would likely apply to undocumented adults if eligibility for full-scope Medi-Cal were expanded. 62. Randolph Capps and Karina Fortuny, “The Characteristics of Unauthorized Immigrants in California, Los Angeles County, and the United States” (Urban Institute, March 6, 2007), https://www.urban.org/research/publication/characteristics-unauthorized-immigrants-california-los-angeles-county-and-united-states. 63. U.S. Department of Homeland Security, “Proposed Rule: Inadmissibilty on Public Charge Grounds” (2018), https://www.federalregister.gov/documents/2018/10/10/2018-21106/inadmissibility-on-public-charge-grounds. 64. Michael E. Fix and Jeffrey S. Passel, “Trends in Noncitizens’ and Citizens’ Use of Public Benefits Following Welfare Reform,” Urban Institute, March 1, 1999, https://www.urban.org/research/publication/trends-noncitizens-and-citizens-use-public-benefits-following-welfare-reform. Michael E. Fix and Jeffrey S. Passel, “Scope and Impact of Welfare Reform’s Immigrant Provisions, The,” January 15, 2002, https://www.urban.org/research/publication/scope-and-impact-welfare-reforms-immigrant-provisions. Namratha R. Kandula et al., “The Unintended Impact of Welfare Reform on the Medicaid Enrollment of Eligible Immigrants,” Health Services Research 39, no. 5 (2004): 1509–26, https://doi.org/10.1111/j.1475-6773.2004.00301.x. 65. See for example: Ninez A. Ponce, Laurel Lucia, and Tia Shimada, “Proposed Changes to Immigration Rules Could Cost California Jobs, Harm Public Health” (UCLA Center for Health Policy Research, December 2018), http://healthpolicy.ucla.edu/publications/Documents/PDF/2018/publiccharge-factsheet-dec2018.pdf. Fiscal Policy Institute, “‘Only Wealthy Immigrants Need Apply’ How a Trump Rule’s Chilling Effect Will Harm the U.S.,” October 10, 2018, http://fiscalpolicy.org/public-charge. Samantha Artiga et al., “Potential Effects of Public Charge Changes on Health Coverage for Citizen Children – Issue Brief” (Kaiser Family Foundation, May 18, 2018), https://www.kff.org/report-section/potential-effects-of-public-charge-changes-on-health-coverage-for-citizen-children-issue-brief/. I am grateful to The California Endowment for their support of this report. I would like to thank Beth Capell (Health Access), Richard Figueroa (The California Endowment), Jen Flory (Western Center on Law and Poverty), Deepen Gagneja (California Immigrant Policy Center), Ken Jacobs (UC Berkeley), and Nadereh Pourat (UCLA) for their review of this report. I appreciate Ninez Ponce and Riti Shimkhada for their research related to the proposed public charge rule; Tanya Broder and Gabrielle Lessard for their legal analysis related to public charge; and Miranda Dietz and Dave Graham-Squire for their analysis on changes in eligibility due to minimum wage policy. Thanks to Deborah Meacham and Jenifer MacGillvary for their help in preparation of the report. Supported by The California Endowment. Laurel Lucia is director of the health care program at the UC Berkeley Center for Labor Research and Education. The analyses, interpretations, conclusions, and views expressed in this report are those of the author and do not necessarily represent the UC Berkeley Institute for Research on Labor and Employment, the UC Berkeley Center for Labor Research and Education, the Regents of the University of California, or collaborating organizations or funders.